Long-time readers of this here blog may recall that back in February of last year I completely went out of my nut over Debutante, the astoundingly assured (self-released) debut album by singer/songwriter/force of nature Cait Brennan. And now comes her non-slump sophomore effort Third -- via the fine folks at Omnivore Records (where she belongs) -- which is, cheekily, named after a certain album by a certain Memphis band you may have heard of. And which (much like Debutante was for me in 2016) is already my 2017 album of the year even though it's not even summer yet. 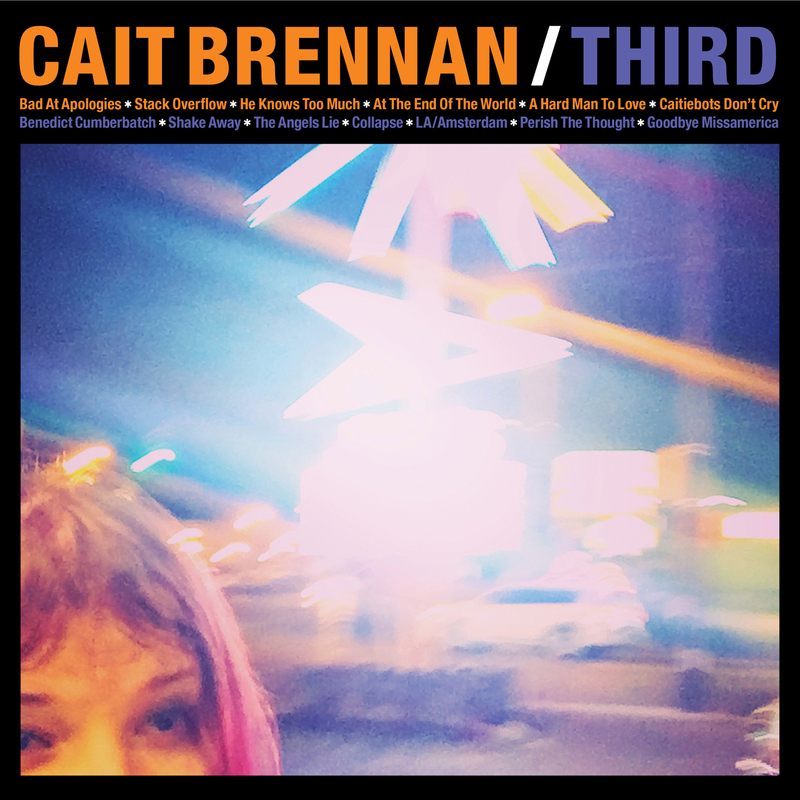 "Cait Brennan has an instantly recognizable voice, and, paired with her sugary power pop proclivities, makes the kind of music that stops me in my tracks. With an undeniable gift for writing hooky delights, she’s an heir to the throne of the greats: ELO, Nilsson, The Sweet, Rundgren. Her influences are all over her songs and Debutante is a sparkly kaleidoscope of AM Radio, 1970s pop, and confessional lyrics. It’s delightful. I couldn't agree more, although at the time I added Big Star (little did I know) and Glam Era Mott the Hoople and David Bowie to the list of reference points; listening to the new record -- which in a lot of ways is considerably darker in tone -- I also hear flashes of Prince and early 70s pre-disco r&b and soul as well. In any event, those previously mentioned long-time readers may also recall I have already gone on record as saying that "Bad at Apologies" -- the lead off track from Third -- has one of the greatest opening lines in rock history. Which is certainly true, and if there's any justice in this world, the song's choruses will also be sung by a stadium audience near you sometime very soon. But (mirabile dictu) the rest of the album (recorded at the same Ardent studio as Big Star's masterpieces) is a real advance over Debutante; musically and lyrically richer in just about every way. It may not be an exaggeration to say that Cait and co-producer/multi-instrumentalist Fernando Perdomo could be the most synergistically-matched team of artistic collaborators since those four kids from Liverpool hooked up with that older guy at EMI who had recorded The Goons. I'm particularly enamored of "Goodbye Missamerica," which -- over the sounds of Alex Chilton's very own mellotron -- speaks rather poignantly in part to the current state of the US of A and Cait's personal backstory; "Benedict Cumberbatch," a big sort of Queen-inspired power ballad in which Cait tells a faithless lover that she's giving the song to the Dr. Strange/Sherlock star instead; and "Caitiebots Don't Cry," which is such an astoundingly smart piece of self-referential post-modern pop that you don't know whether to laugh out loud or go "I'm not worthy" or both. But there's not a song on the record that doesn't repay the time spent in listening. And hardly one that doesn't make you want to get up and dance around your house -- as John Lennon put it -- in wild abdomen. Have I mentioned that Cait's vocals throughout are beyond amazing? That duty pleasantly dispatched, I will end by pointing out that you can learn more about Cait and Third over at her official website HERE. You can also purchase said fine audio product over at Amazon HERE and what are you waiting for? The guitar solo on "Apologies" is awesome. Seriously -- that's the technical word for it. The best recommended CD here since the Floor Models! "Bad at Apologies" is the real thing, if the rest of the album is closer to this good it's gonna be another winner for Cait! Your Friday Moment of Lothar Mania! Today We Are a CD! Your Friday Moment of Four Strings Good! Be a Patron of the Arts -- It's Fun!